Think of Philly, and a few images come to mind -- cheesesteaks, the Liberty Bell, Rocky... and LOVE Park. For the past 40 years, the Center City landmark has been one of the city's most visited and photographed destinations. 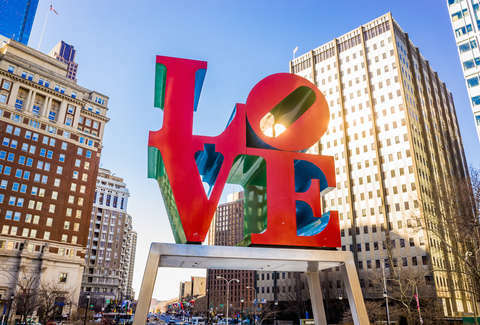 But this spring (like, right now), a $16.5 million renovation will close the park for a year, while the LOVE statue is relocated across the street, to Dilworth Park. How well do you actually know the city’s most famous park? (Sorry, Rittenhouse.) From 92-year-old skateboarders to textbook Philly governmental incompetence, here are 10 things you (probably) didn’t know about the beloved park. Think about them while the fountain gets its LED implants and new green space. Mr. Bacon, the city's most famous planner and “The Father of Modern Philadelphia,” was an architectural student at Cornell when he first included the idea of the urban park as part of his senior thesis. Edmund, by the way, is also the father to one of Philly’s favorite famous exports. Construction of the park was completed in 1965, and on May 9, 1967, it was dedicated to Kennedy, which is noted in the plaza with a small brown plaque. The LOVE stuff comes a bit later. 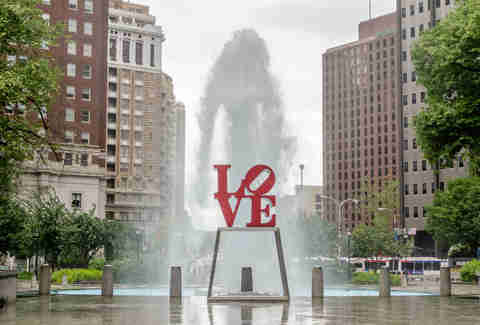 To celebrate the nation’s bicentennial, designer Robert Indiana lent the sculpture to the city, where it ended up sitting on a two-year extended loan until it was removed in 1978. After some uproar -- it’s Philly after all -- the statue made its way back as a permanent part of the plaza. From a design standpoint, the negative space in the “O” is heavily italicized so that it draws your attention back to the V. Or, you could interpret it as Indiana understood it: that love isn’t perfect (he was divorced multiple times). Official dimensions put it at 6ft by 6ft by 3ft. For perspective, Philly’s other most famous statue, William Penn, is 27ft tall. In 1985, Spike’s Skates opened as one of the East Coast’s first skateboarding shops, and by the early '90s, Philly was producing some of the best skateboarders in the country. Thanks to its smooth granite and multiple “natural” jumps, LOVE Park quickly became a mecca for local and national skaters, making the park famous nationwide. Because we can’t have nice things, the city, of course, has banned skating multiple times in LOVE park. The first time was in 1995, but enforcement was fairly lax -- after all, Mayor Ed Rendell’s son was a skateboarder. Then in 2000, City Council banned all skateboarding on public property, writing a law that specifically targeted skating in JFK Plaza. The dude was the man. When the X Games came to Philly in 2001, skateboarding was temporarily saved, with Philly actually embracing the idea (thanks in part to huge TV numbers), and the mayor appearing in promo spots for the event. At the same time, Philly also had plans to renovate the park; in 2002, the city launched a series of “renovations” designed to make the park un-skateable. Following renovations, the city decided to strictly enforce the 2000 ban. Dan McKay never took a photo in front of the LOVE statue, and now it’s too late... damn. You can see his other photos by following him on Instagram or Twitter @dannypageviews.